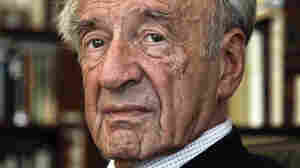 Night NPR coverage of Night by Elie Wiesel. News, author interviews, critics' picks and more. 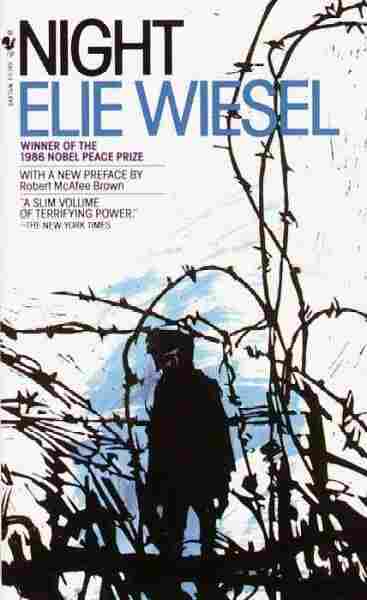 Recalls the Nobel laureate's war years. They called him Moshe the Beadle, as though he had never had asurname in his life. He was a man of all work at a Hasidicsynagogue. The Jews of Sighet-that little town in Transylvaniawhere I spent my childhood-were very fond of him. He was very poorand lived humbly. Generally my fellow townspeople, though they wouldhelp the poor, were not particularly fond of them. Moshe the Beadlewas the exception. Nobody ever felt embarrassed by him. Nobody everfelt encumbered by his presence. He was a past master in the art ofmaking himself insignificant, o seeming invisible. Physically he was as awkward as a clown. He mad people smile, withhis waiflike timidity. I loved his great dreaming eyes, their gazelost in the distance. He spoke little. He used to sing, or, rather,to chant. Such snatches a you could hear told of the suffering ofthe divinity, of the Exile of Providence, who, according to thecabbala, await his deliverance in that of man. I got to know him toward the end of 1941. I was twelve. I believedprofoundly. During the day I studied the Talmud, and at night I ranto the synagogue to weep over the destruction of the Temple. One day I asked my father to find me a master to guide me in mystudies of the cabbala. "You're too young for that. Maimonides said it was only at thirtythat one had the right to venture into the perilous world ofmysticism. You must first study the basic subjects within your ownunderstanding." My father was a cultured, rather unsentimental man. There was neverany display of emotion, even at home. He was more concerned withothers than with his own family. The Jewish community in Sighet heldhim in the greatest esteem. They often used to consult him aboutpublic matters and even about private ones. There were four of uschildren: Hilda, the eldest; then Sea; I was the third, and the onlyson; the baby of the family was Tzipora. My parents ran a shop. Hilda and Ba helped them with the work. Asfor me, they said my place was at school. "There aren't any cabbalists at Sighet," my father would repeat. He wanted to drive the notion out of my head. But it was in vain. Ifound a master for myself, Moshe the Beadle. "Why do you weep when you pray?" he asked me, as though he had knownme a long time. The question had never entered my head. I wept because-because ofsomething inside me that felt the need for tears. That was all Iknew. Why did I pray? A strange question. Why did I live? Why did Ibreathe? "I don't know why," I said, even more disturbed and ill at ease. "Idon't know why." After that day I saw him often. He explained to me with greatinsistence that every question possessed a power that did not lie inthe answer. "Man raises himself toward God by the questions he asks Him," he wasfond of repeating. "That is the true dialogue. Man questions God andGod answers. But we don't understand His answers. We can'tunderstand them. Because they come from the depths of the soul, andthey stay there until death. You will find the true answers,Eliezer, only within yourself!" "I pray to the God within me that He will give me the strength toask Him the right questions." We talked like this nearly every evening. We used to stay in thesynagogue after all the faithful had left, sifting in the gloom,where a few half-burned candles still gave a flickering light. "There are a thousand and one gates leading into the orchard ofmystics] truth. Every human being has his own gate. We must nevermake the mistake of wanting to enter the orchard by any gate but ourown. To do this is dangerous for the one who enters and also forthose who are already there." And Moshe the Beadle, the poor barefoot of Sighet, talked to me forlong hours of the revelations and mysteries of the cabbala. It waswith him that my initiation began. We would read together, ten limesover, the same page of the Zohar. Not to learn it by heart, but toextract the divine essence from it. And throughout those evenings a conviction grew in me that Moshe theBeadle would draw me with him into eternity, into that time wherequestion and answer would become one. Then one day they expelled all the foreign Jews from Sighet. AndMoshe the Beadle was a foreigner. Crammed into cattle trains by Hungarian police, they wept bitterly.We stood on the platform and wept too. The train disappeared on thehorizon; it left nothing behind but its thick, dirty smoke. I heard a Jew behind me heave a sigh. "What can we expect?" he said. "It's war ..."
The deportees were soon forgotten. A few days after they had gone,people were saying that they had arrived in Galicia, were workingthere, and were even satisfied with their lot. Several days passed. Several weeks. Several months. Life hadreturned to normal. A wind of calmness and reassurance blew throughour houses. The traders were doing good business, the students livedburied in their books, and the children played in the streets. One day, as I was just going into the synagogue, I saw, sitting on abench near the door, Moshe the Beadle. He told his story and that of his companions. The train full ofdeportees had crossed the Hungarian frontier and on Polish territoryhad been taken in charge by the Gestapo. There it had stopped. TheJews had to get out and climb into lorries. The lorries drove towarda forest. The Jews were made to get out. They were made to dig hugegraves. And when they had finished their work, the Gestapo begantheirs. Without passion, without haste, they slaughtered theirprisoners. Each one had to go up to the hole and present his neck.Babies were thrown into the air and the machine gunners used them astargets. This was in the forest of Galicia, near Kolomaye. How hadMoshe the Beadle escaped? Miraculously. He was wounded in the legand taken for dead. Through long days and nights, he went from one Jewish house toanother, telling the story of Malka, the young girl who had takenthree days to die, and of Tobias, the tailor, who had begged to bekilled before his sons. Moshe had changed. There was no longer any joy in his eyes. He nolonger sang. He no longer talked to me of God or of the cabbala, butonly of what he had seen. People refused not only to believe hisstories, but even to listen to them. "He's just trying to make us pity him. What an imagination he has! "they said. Or even: "Poor fellow. He's gone mad." And as for Moshe, he wept. "Jews, listen to me. Its all I ask of you. I don't want money orpity. Only listen to me," he would cry between prayers at dusk andthe evening prayers. I did not believe him myself. I would often sit with him in theevening after the service, listening to his stories and trying myhardest to understand his grief. I felt only pity for him. "They take me for a madman," he would whisper, and tears, like dropsof wax, flowed from his eyes. "Why are you so anxious that people should believe what you say? Inyour place, I shouldn't care whether they believed me or not ..."
He closed his eyes, as though to escape time. "You don't understand," he said in despair. "You can't understand. Ihave been saved miraculously. I managed to get back here. Where didI get the strength from? I wanted to come back to Sighet to tell youthe story of my death. So that you could prepare yourselves whilethere was still time. To live? I don't attach any importance to mylife any more. I'm alone. No, I wanted to come back, and to warnyou. And see how it is, no one will listen to me. That was toward the end of 1942. Afterward life returned to normal.The London radio, which we listened to every evening, gave usheartening news: the daily bombardment of Germany; Stalingrad;preparation for the second front. And we, the Jews of Sighet, werewaiting for better days, which would not be long in coming now. I continued to devote myself to my studies. By day, the Talmud, atnight, the cabbala. My father was occupied with his business and thedoings of the community. My grandfather had come to celebrate theNew Year with us, so that he could attend the services of the famousrabbi of Borsche. My mother began to think that it was high time tofind a suitable young man for Hilda. Spring 1944. Good news from the Russian front. No doubt could remainnow of Germany's defeat. It was only a question of time of months orweeks perhaps. The trees were in blossom. This was a year like any other, with itsspringtime, its betrothals, its weddings and births. People said: "The Russian army's making gigantic strides forward ...Hitler won't be able to do us any harm, even if he wants to." Yes, we even doubted that he wanted to exterminate us. Was he going to wipe out a whole people? Could he exterminate apopulation scattered throughout so many countries? So many millions!What methods could he use? And in the middle of the twentiethcentury! Besides, people were interested in everything-in strategy, indiplomacy, in politics, in Zionism-but not in their own fate. Even Moshe the Beadle was silent. He was weary of speaking. Hewandered in the synagogue or in the streets, with his eyes down, hisback bent, avoiding people's eyes. "I'm too old, my son," he replied. "I'm too old to start a new life.I'm too old to start from scratch again in a country so far away. The Budapest radio announced that the Fascist party had come intopower. Horthy had been forced to ask one of the leaders of theNyilas party to form a new government. Still this was not enough to worry us. Of course we had heard aboutthe Fascists, but they were still just an abstraction to us. Thiswas only a change in the administration. The following day, there was more disturbing news: with governmentpermission, German troops had entered Hungarian territory. "The Jews in Budapest are living in an atmosphere of fear and tenor.There are anti-Semitic incidents every day, in the streets, in thetrains. The Fascists are attacking Jewish shops and synagogues. Thesituation is getting very serious." This news spread like wildfire through Sighet. Soon it was oneveryone's lips. But not for long. Optimism soon revived. "The Germans won't get as far as this. They'll stay in Budapest.There are strategic and political reasons ..."
Before three days had passed, German army cars had appeared in ourstreets. Anguish. German soldiers-with their steel helmets, and their emblem,the death's head. However, our first impressions of the Germans were most reassuring.The officers were billeted in private houses, even in the homes ofJews. Their attitude toward their hosts was distant, but polite.They never demanded the impossible, made no unpleasant comments, andeven smiled occasionally at the mistress of the house. One Germanofficer lived in the house opposite ours. He had a room with theKahn family. They said he was a charming man-calm, likable, polite,and sympathetic. Three days after he moved in he brought Madame Kahna box of chocolates The optimists rejoiced. "Well, there you are, you see! What did we tell you? You wouldn'tbelieve us. There they are your Germans! What do you think of them?Where is their famous cruelty?" The Germans were already in the town, the Fascists were already inpower, the verdict had already been pronounced, yet the Jews ofSighet continued to smile.